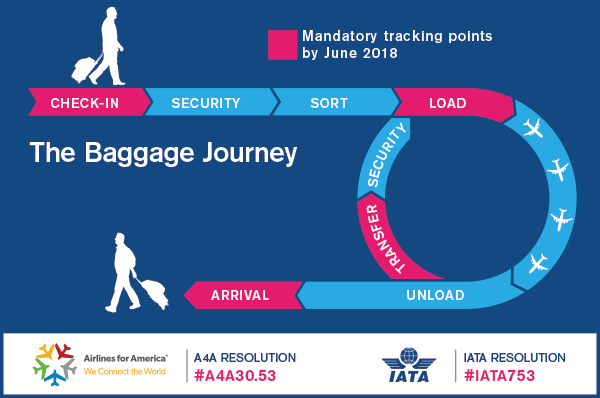 Montreal, Canada, 2017-Jul-23 — /Travel PR News/ — The International Air Transport Association (IATA) and Airlines for America(A4A), have launched a year-long global campaign related to baggage tracking with the goal of reducing mishandled bags in addition to increasing efficiency in baggage operations. Annually, more than 4 billion bags are carried by airlines globally. Less than 0.43 percent do not arrive with their owners. The industry is determined to do even better and has agreed to Resolution 753 (R753). By June 2018, airlines have committed to being able to track a bag when it is accepted at the airport, loaded onto the aircraft, transferred to the arrival system or put into the transfer system for carriage by another airline. Airlines should also be able to share this tracking information with interline carriers as needed. “Arriving without a bag is a very frustrating experience for our customers. Over the last decade we have reduced mishandled baggage by 54% with improved processes. The next step is to realize the full benefits of baggage tracking to further improve performance. In the rare cases when a bag does not arrive with the passenger there will be much more information available to facilitate a quicker reunion. And the benefits don’t stop there. Tracking bags will, enable proactive reporting, speed up aircraft readiness for departure, facilitate the automation of baggage processes and also reduce fraud,” said Andrew Price, IATA’s Global Head of Baggage. The baggage tracking campaign will help airlines prepare for the R753 June 2018 implementation deadline with a series of initiatives tailored to various stakeholders. These include regional workshops for key aviation entities and an awareness campaign for travelers. An implementation guide developed by industry partners is also available. In addition, IATA is offering member airlines a readiness certificate to recognize them when they develop their implementation plan for R753. Annually, commercial aviation helps drive $1.5 trillion in U.S. economic activity and more than 10 million U.S. jobs. Airlines for America(A4A) vigorously advocates on behalf of the American airline industry as a model of safety, customer service and environmental responsibility and as the indispensable network that drives our nation’s economy and global competitiveness. This entry was posted in Airlines, Airports, Business, Flights, Hospitality, Luggage and Accessories, Tour Operators, Travel, Travel Agents, Travel Apps, Travel Management, Travel Safety, Travel Services, Travel Tech, Travel Tips & Info, Travelers and tagged A4A, Airlines for America, Andrew Price, baggage tracking, IATA, Patty Edwards, R753. Bookmark the permalink.